Hey everyone! 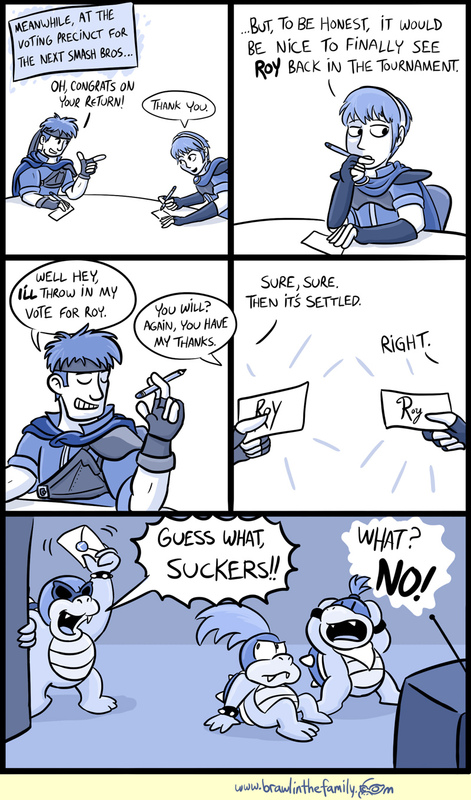 About today’s strip, Marth’s been confirmed so I’ve decided to revisit the “Smash Voters” concept to see how that’d play out. I don’t believe he’s ever spoken before in the comic, so I took care to make his dialogue a little more proper-sounding than the average brawler. Man, the Fire Emblem boys take me forever to draw. Thanks so much for the support so far on the Tadpole Treble Kickstarter! We’re over 1/3 of the way to making the game a reality now, but there’s still a ways to go before it’ll be finished (and on the Wii U), so keep letting people know who might be interested! I started a Reddit AMA yesterday and will be answering more questions today at 2 PM Central, so come on by if you want to ask me anything…today will be the last day I answer these!